In August of 2007, Cindy and I decided to take Walt Disney up on it’s offer, and stay at the parks for a longer period of time than just a day or two. We had been the previous year with Meemaw, and the year before with Leigh Ann and Riley (and family), and seeing how much fun it was with them just fueled our need for more Disney Magic! So Cindy and I decided to take the plunge and book a resort to stay at. We had always assumed (somewhat incorrectly, I might add) that staying on property was 1) for those with more money than sense, and 2) really, really expensive, so when we looked into the idea, I know that I was thinking we weren’t going to be able to swing it. Boy, was I ever wrong! Have you ever stayed at Disney World on property before? If you haven’t, I really suggest that you take a look at it. Not only are there all sorts of different themed hotels for you to choose from, there are also several different levels that you can stay at depending on your budget! and, coming in Summer 2012, Disney’s Art of Animation Resort. 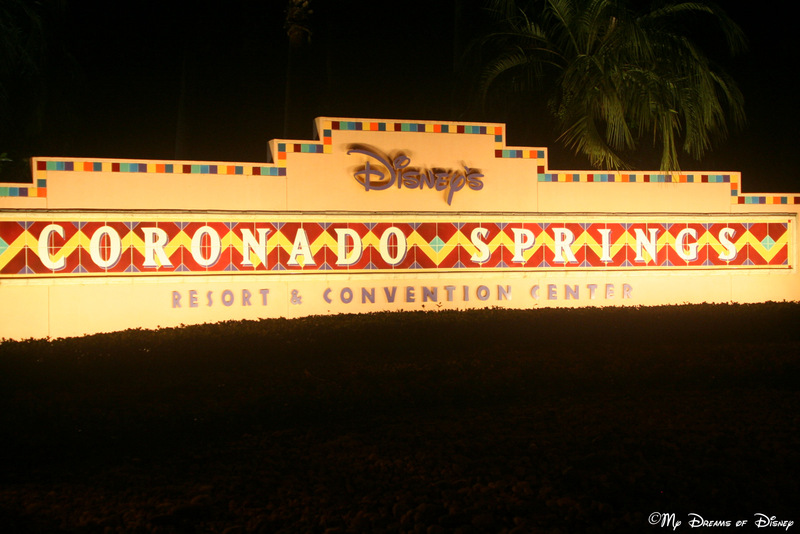 These resorts are all classified as value resorts, which means that they are the least expensive of the Disney resorts. In many cases, though, they can be worth it if you have large parties because some of these resorts offer rooms that can sleep more than 5 people. We looked at a lot of them, but in this instance choose Coronado Springs Resort. We liked the Aztec influence in the decor, we thought that the big pool looked really neat from Google Earth and the website, and the color scheme chosen for the buildings was really quite nice. We enjoyed it a great deal! For this first year, we booked our trip directly from the Disney World website. The special that year was the free dining plan. Book a stay at a Disney resort, stay a certain number of days, and you will get the Disney Dining Plan for free. That means that one snack, one quick service meal, and one table service meal per person per day is already paid for! Doing the dining plan for us meant that we were able to go to a lot of restaurants that we wouldn’t normally go to, which meant that we could choose character places so Sophie could get a ton of autographs, and we wouldn’t have to pay for a lot of food while we were at the parks! Having the dining plan is one of the biggest benefits for us staying at a Disney resort! I have a ton of pictures from that first extended trip to Walt Disney World, but rather than upload them all, take a look at the embedded slideshow! Enjoy, and feel free to comment! New Free Dining and Resort Room Only Discounts! Walt Disney World – Staying On Property vs. Off Property. Wordless Wednesday – My June Calendar Shot! How Free Disney Dining Can Save you money! Previous Post: Applications end tomorrow!